Student life at WHU is not just about studying - in their free time, our students enthusiastically pursue a wide range of extracurricular activities, making campus an exciting place to be. Whether you love sports, the theater, music, entrepreneurship, the community, debating, or are even partial to casual wine tasting, there truly is something for everyone. 40 creative students, three days, one goal: start your own company. Can you set up a business in just three days? Yes! WHU’s first initiative revolving around tech and IT. We aim towards encouraging students with a business background to engage themselves with tech-related topics. The WHU Private Equity Conference unites students, academics, corporate representatives and politicians to create a unique platform for discussing current topics in the private equity sector. confluentes, the student management consultancy at WHU, supports companies of all sizes with services from all areas of the value chain. Today 1000 consultants implement > 130 projects per year. Enactus inspires students to improve the world through entrepreneurial action. The Enactus WHU Vallendar team is recognized as a non-profit organization, currently engaging in international and national projects. In case of an emergency, the members of WHU First Responder provide qualified first aid. All members have completed extensive rescue training and want to volunteer their knowledge and skills to the community. Every year, forumWHU unites more than 200 students from renowned European universities with the decision makers from economy and politics, so that they can discuss about current issues between society, economy and politics. The WHU GenerationsCup is a fun leisure event within the framework of the annual Frankfurt Marathon. Anyone who wants to take part can either run alone or divide the stages in a team. Founded by WHU students in 1985, the WHU Sports Association maintains and encourages sports at WHU. Besides our own WHU gym, we have volleyball, basketball, soccer, cheerleading, and rowing teams. We organize wine seminars and wine-tasting sessions on WHU Campus Vallendar. Our motto is "Life is too short to drink bad wine". We are students who are politically active while studying and who stand up for liberal values. In addition to regular get-togethers, we also organize events on liberal topics in which we combine politics and fun. We are a political student organization with conservative leanings, close to the CDU/CSU, but retaining our independence. We are open to controversial debates and alternative points of view. We support social organizations with business know-how regarding organizational and economic questions. We advise a wide range of social and non-profit institutions. SmartUp! hosts regular on-campus workshops with experienced entrepreneurs, and organizes yearly tours to Berlin, Cologne, and Munich to visit selected set of startups from various industries. The annual conference gives students from all over Germany basic knowledge about startups and impulses for self-employment. With >150 participants, we offer a platform for exchange and the realisation of ideas. The WHU Theater Group is known for the extraordinary dedication of the constantly changing members of the ensemble, great attention to detail and very different types of characters, rewarded by regularly sold-out performances. We aim to provide a platform for today’s most revolutionary, inspiring and creative thinkers. TEDxWHU is an immersive, day-long conference with numerous speakers, also offering great networking opportunities. Experience exciting lectures about stock markets and finance and show your knowledge in interactive workshops. Meet renowned personalities from the world of finance and make valuable contacts! We are a student initiative that supports the integration of exchange students into the local WHU community. We organize cultural and networking events, and offer social support to the exchange students in their new environment. The WHU Debating Union organizes weekly debates in English as well as rhetoric and presentation skills workshops. Beginners and experienced debaters alike are welcome! We offer a platform to discuss business ideas, practice pitching and receive expert advice on startups and entrepreneurship. Our thematic priorities are classical investment banking, investment management, sales & trading, as well as management consulting in the financial sector, providing academic sessions and networking opportunities. The WHU Golf club stands for the reunion of WHU generations in a relaxed and enjoyable enviroment combined with a sporty challenge during a fabulous round of golf. Our aim is to provide new insights directly from executives and managers in the areas of digitalization, supply chain management, entrepreneurship, and finance. WHU Students Help e.V. intends to give something back to the community, e.g. via collecting donations at the annual charity concert and doing regular projects concerning the community in Vallendar. A strong and vibrant community – Explore the WHU spirit. Discover how diverse student life is at WHU and what is happening at WHU in regards to sports, the theater, music, entrepreneurship, the community, debating, etc. Find out more about the student experience in Vallendar and Düsseldorf, and take a look at the various student clubs. TEDxWHU: A total of seven speakers presented their reasons why the status quo should be questioned. WHU Students Help, better known as WHUSH, is an active initiative with over 500 members and a donation volume of over €200,000 to date. Events take place throughout the year in Vallendar and beyond, bringing WHU students into the community. How is Entrepreneurship Relevant in the Corporate World? “A person who sets up a business or businesses, taking on financial risks in the hope of profit.” Perfect for those with a bold idea ready to take it forwards. But what if entrepreneurship can be used differently? Five Questions to "Diversity at WHU"
A climate characterized by openness, diversity and equal opportunities is extremely important to WHU. Part of this mindset is "Diversity at WHU". On November 9 and 10, 2018, the 21. WHU Euromasters took place at WHU - Otto Beisheim School of Management in Vallendar. "New Generation Finance: The Landscape is Changing - Are You?" We offer excellent study opportunities for people of any age and with a wide range of work experience. 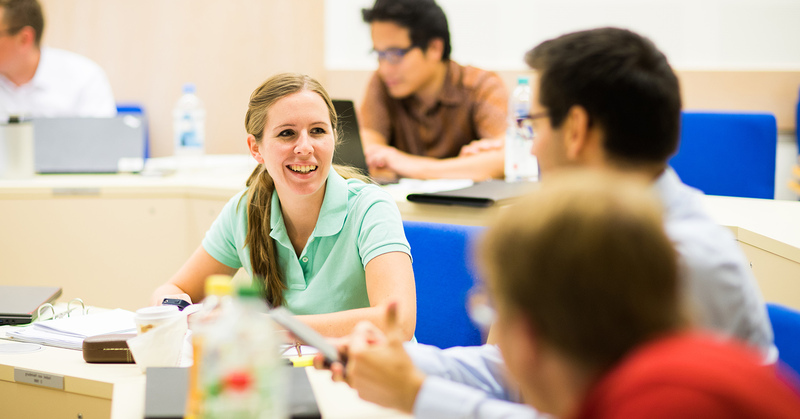 Next to the undergraduate (BSc in International Business Administration) and graduate programs (MSc in Management, MSc in Finance, MSc in Entrepreneurship), we offer Full-Time and Part-Time MBA programs, an Executive MBA program and Executive Education. This way, WHU contributes to and supports lifelong learning experiences.